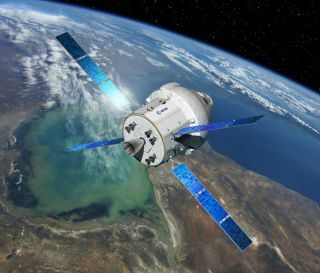 NASA's Orion spacecraft will carry astronauts further into space than ever before using a module based on Europe’s Automated Transfer Vehicles (ATV). The image was released Jan. 17, 2013. NASA's next manned spaceship, the Orion capsule, will be dropped over Arizona Wednesday (July 24) for a parachute test that will be broadcast live in a Google+ Hangout. SPACE.com's Clara Moskowitz will be one of a few reporters participating as Hangout guests to ask questions during the event. Orion is a gumdrop-shaped vehicle designed to take astronauts beyond low-Earth orbit to the moon, Mars and nearby asteroids. The spacecraft is expected to make its first test flight to space in 2014, with its initialcrewed flight coming in 2021. Wednesday's test will see an Orion prototype dropped from a plane at an altitude of 35,000 feet (10,700 meters) over the U.S. Army's Yuma Proving Ground in southwestern Arizona. Engineers will simulate a series of failures and test the parachute system's ability to adapt and land the capsule safely. Orion has three main parachutes, and the NASA team plans to simulate the failure of one of the trio to see if the landing sequence can proceed safely with only two. These parachutes will be necessary to slow the spacecraft's descent after its first trip to space, the 2014 test flight scheduled to send the capsule 3,600 miles (5,800 km) away from Earth —well beyond the orbit of the International Space Station. During that maiden flight, the vehicle will be launched by a Delta IV rocket from NASA's Kennedy Space Center in Florida. On its eventual deep space missions, though, Orion will be lofted by NASA's Space Launch System (SLS), a heavy-lift rocket currently in development. When it returns from those far-away destinations, Orion will plummet through Earth's atmosphere at speeds of up to 20,000 mph (32,000 kph). At such a pace, the parachutes will be essential in slowing the vehicle down for a safe landing. NASA plans to use the Orion spacecraft for its mission to visit an asteroid in the mid 2020s. The agency plans to use a robotic vehicle to lasso a near-Earth asteroid and haul it into a stable orbit near the moon. Once there, astronauts will fly on Orion to visit the captured asteroid and return samples to the ground. Viewers of the Google+ Hangout can ask questions viaNASA's Facebook, Google+ or Twitter accounts using the hashtag #askOrion. If you have questions for Clara to ask during the event, please share them in the comments below.